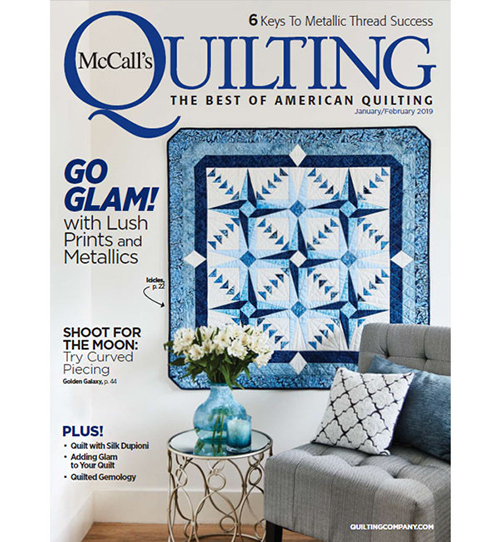 The latest edition of American Patchwork & Quilting went on sale this week, and I’m delighted to share that I have my first quilt design in its pages. This is Color Coded from the June 2019 issue. Color Coded, designed and made by Diane Harris. 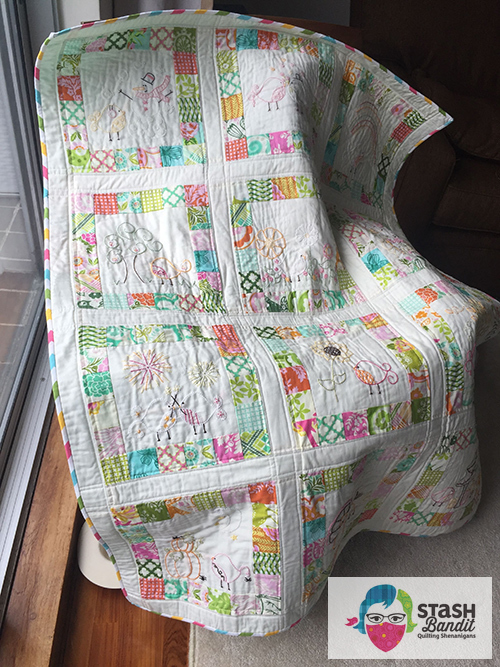 Quilted by Julie Lechner @beenquiltin. 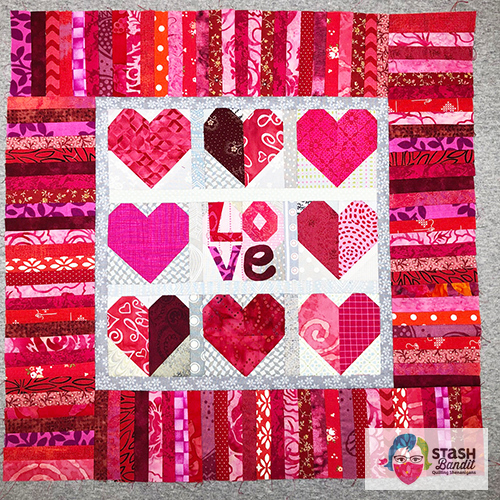 Used with permission from American Patchwork & Quilting®. 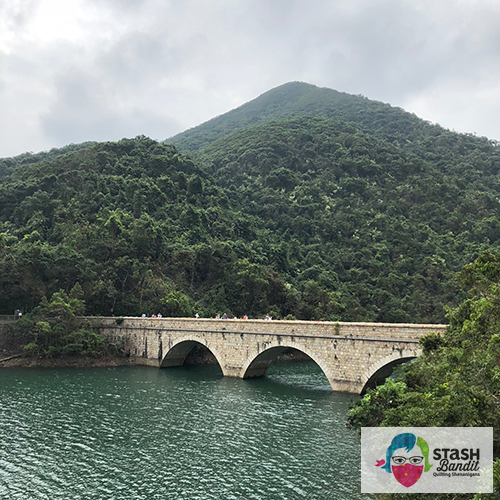 ©2019 Meredith Corporation. All rights reserved. I’m so pleased with the photography! That yellow door makes my heart sing. And the rainbow bookshelf? Oh my word. I love it so much. Jay Wilde was the photographer. 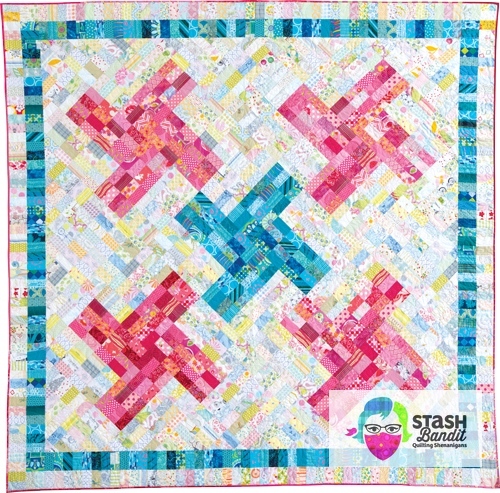 This design is the latest in a series of quilts based on a simple little Windmill block. 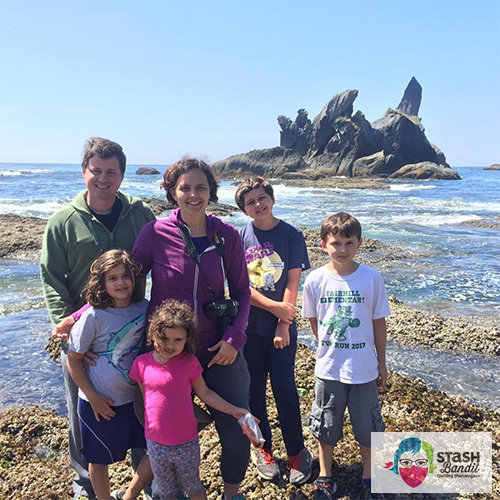 I started making them in 2005 when I’d gone back to work after two decades as a stay-at-home mom. I wasn’t having any time to sew and I wasn’t happy about that, but I was too tired to think. In desperation, I cut a bunch of patches from scraps and began making little Windmills. It was something I could do mindlessly when I didn’t have the energy to make creative decisions. Pretty soon I had dozens, and it wasn’t long before I had hundreds. I needed to do something with them, and after some playtime I realized they had a lot of potential. The first things I made were scrappy, and while they’re attractive enough, they weren’t terribly creative. 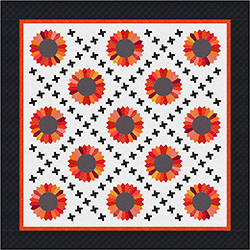 But then my imagination caught fire, and in the past few years, I’ve designed dozens of quilts based on a Baby Windmill. 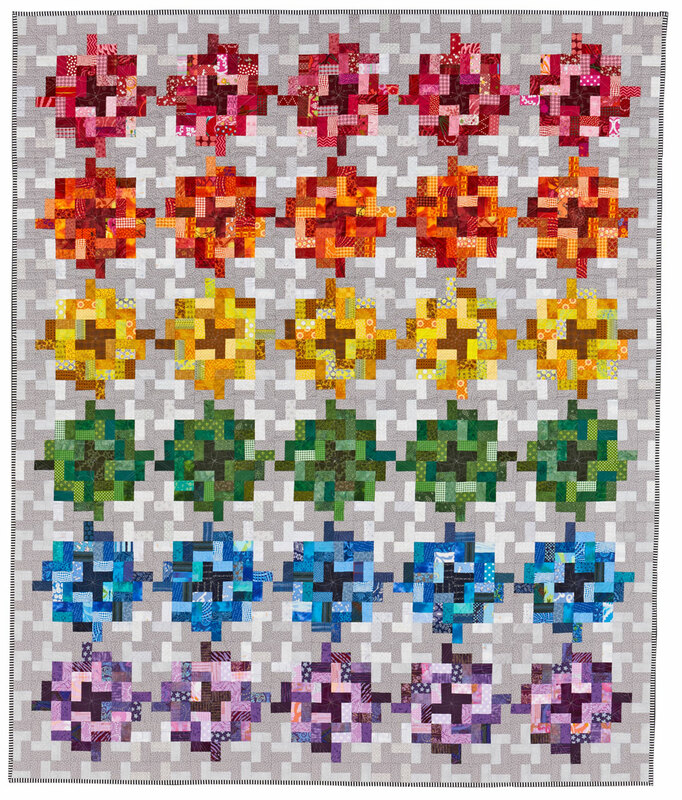 Now I have a whole trunk show of these quilts, and it’s called Windy Wonders. 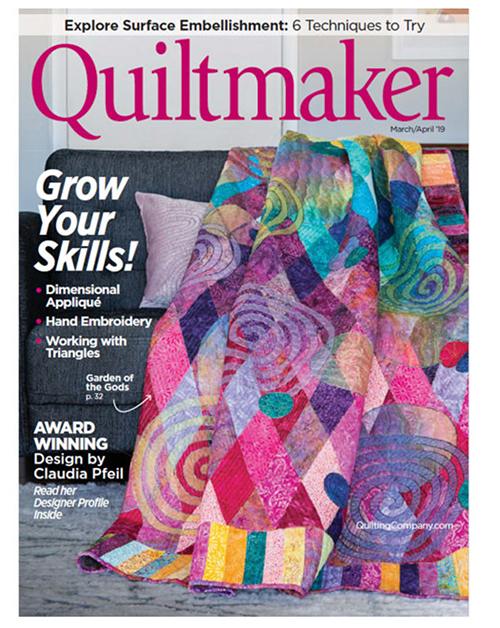 It helps quilters understand how to think like a designer. Spinster by Diane Harris, 79″ x 79″. Photo by Mellisa Karlin Mahoney. Used with permission. Spinster above is an example. 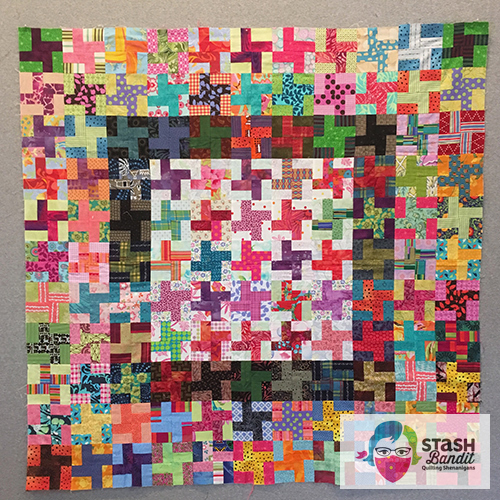 It was made from my stash, as almost all of my quilts are. 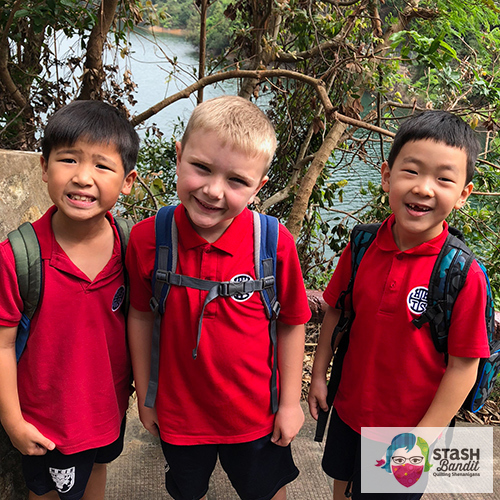 It was unbelievably enjoyable to sew! 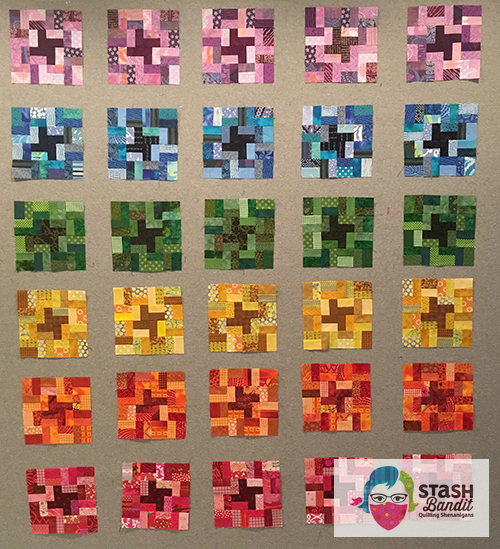 When I made Color Coded, I started by creating the blocks of color. You can see in the orange row that at first they were more muted. As I went along I decided that the Windmill in the middle needed to be more prominent. I didn’t want it to look too mushy. 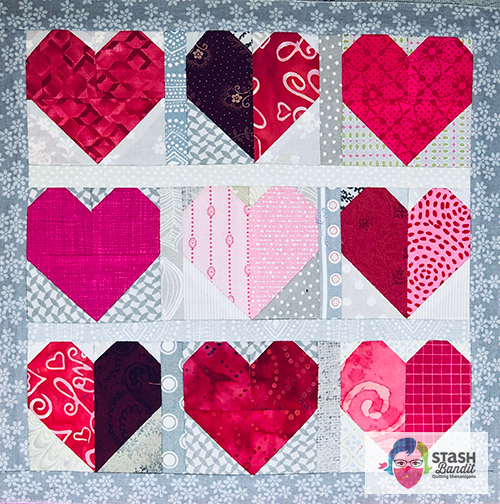 It’s so much fun to dig in your scraps, color bins or drawers for fabrics that will work. And the cutting goes quickly because the patches are all the same size! You can see that I auditioned many different layouts for the colors. I wanted them in rainbow order but I had to think hard about distributing the warm and cool colors from top to bottom. In the end, the warm colors all landed at the top, with the cool colors at the bottom. And maybe it wouldn’t have mattered! 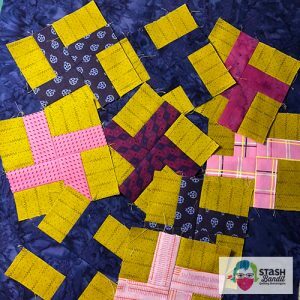 This is a great stashbuster and the sewing is easy. 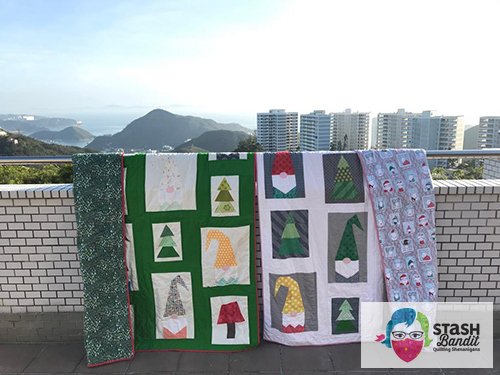 It’s a delight to sew—I never felt bored while making this quilt! 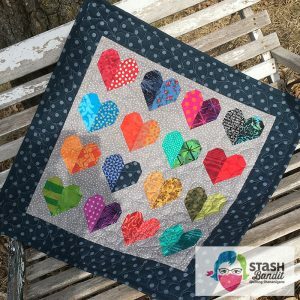 A scrap quilt holds my interest because there’s always some new combination of fabrics to consider. 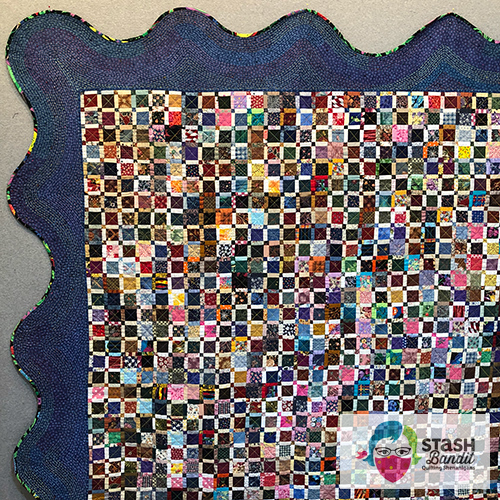 Which is also why I think a scrap quilt is intriguing for a viewer—so much going on. 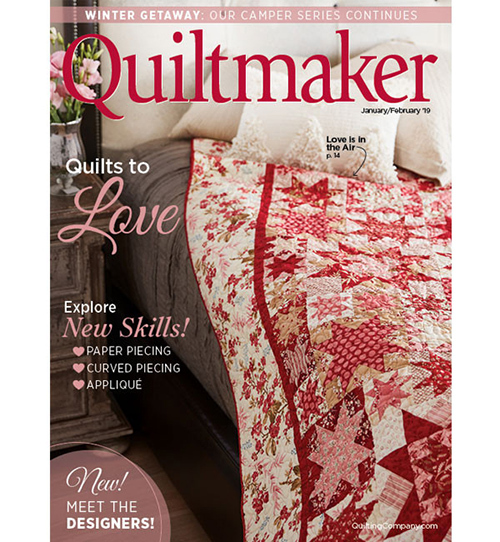 This is the June issue of American Patchwork & Quilting, on newsstands now. I hope you’ll pick yourself up a copy soon! There are many other wonderful designs as well. 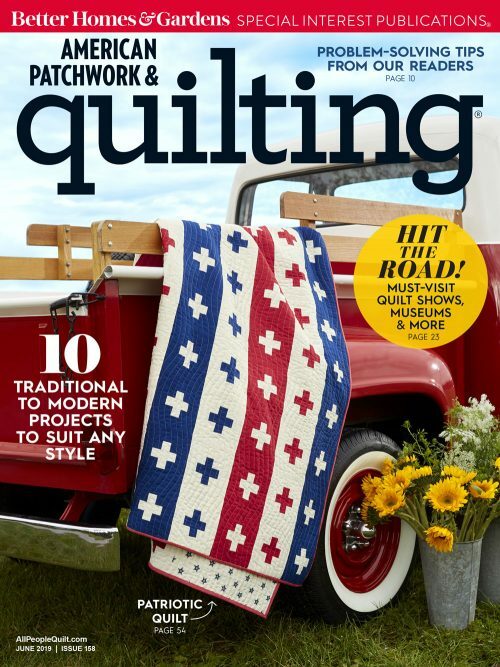 My thanks to editor Jody Sanders, photographer Jay Wilde, and everyone at American Patchwork & Quilting. You’ve done my quilt proud. Learn to make a basic Baby Windmill with my free tutorial! 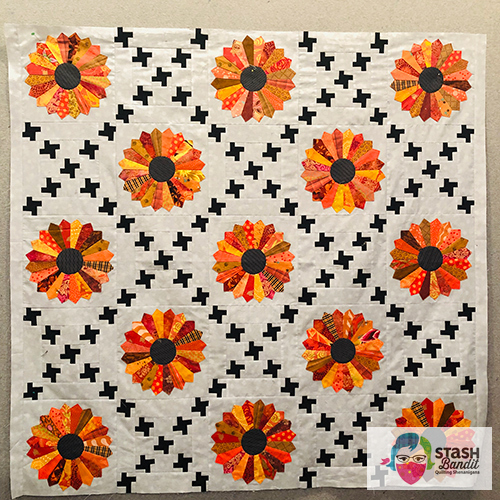 Try my Easy Quilt Label Method! 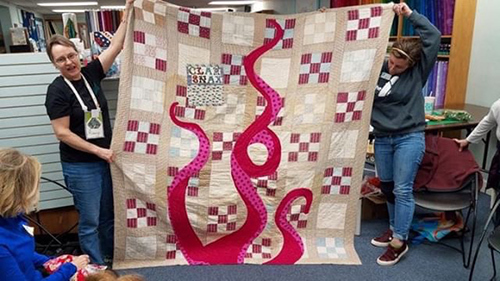 I visited Blue Valley Quilters Guild in Overland Park, Kansas last week and shared “Make Extraordinary Scrap Quilts.” I met nice people, enjoyed show and tell, and got excited for the Kansas City Regional Quilt Festival in June, which BVQG co-sponsors. I’m in the habit of hanging one exemplary quilt on my display stand to set the mood as people arrive. 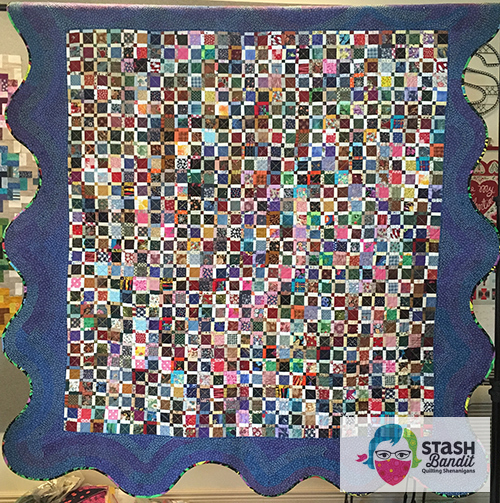 For the scrap quilt trunk show, I use Nine Patch Jambalaya. 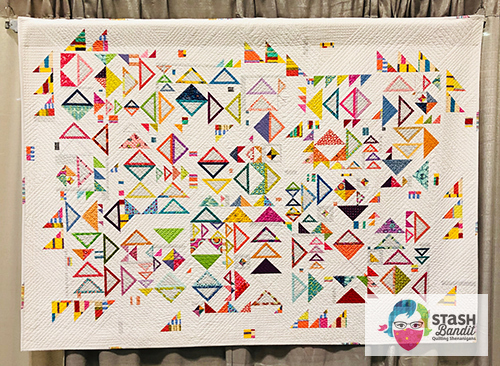 This quilt generates excitement, which amazes me but doesn’t surprise me any more. Today I want to tell you how I made it. One year my small group of 20 quilters made each other Nine Patches. Every month we’d make some for every person in the group. It turned out to be a lot of blocks! I had about 225 Nine Patches made by other people at the end of the year. 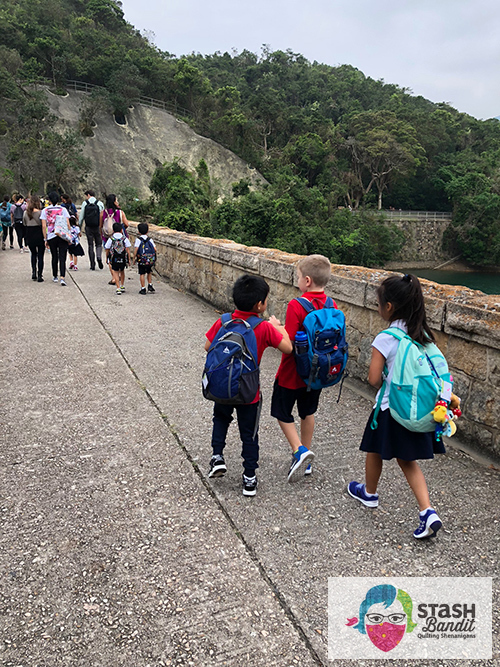 As I looked them over, it was daunting. How could I make them all work together? There were batiks and Halloween, 30’s and Civil War, old calico and Christmas and bright novelty fabrics. There were homespuns in country colors, florals, uglies and poor quality low-thread-count stuff from Walmart. There was everything. To the best of my knowledge, this is the original book on Disappearing Nine Patch Quilts by Nancy Brenan Daniel. Somewhere I had read about the disappearing Nine Patch. 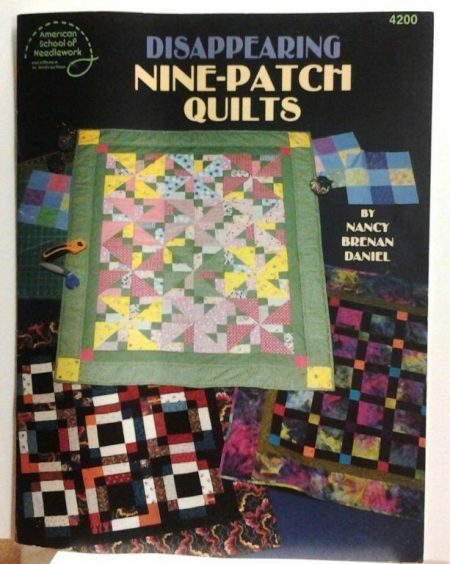 I managed to secure a copy of the original book, Disappearing Nine Patch Quilts by Nancy Brenan Daniel. I didn’t think I had much to lose, so I took a deep breath and started cutting the blocks apart. I put them all in a big pile and began to sew them back together in random order. I consistently kept the tiny square in the top left corner. 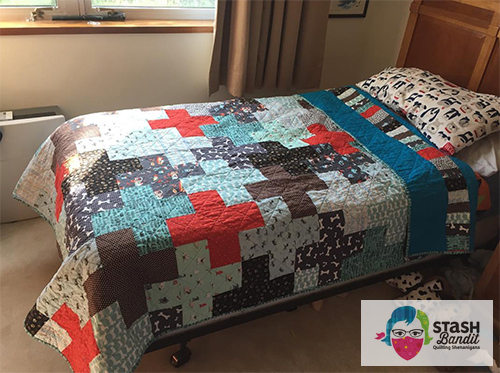 You might not guess it by looking at the quilt, but I thought it was a disaster. As with most exchange blocks, they were not all the same size. So my foursomes of cut units were not the same size either. Nothing lined up at all. 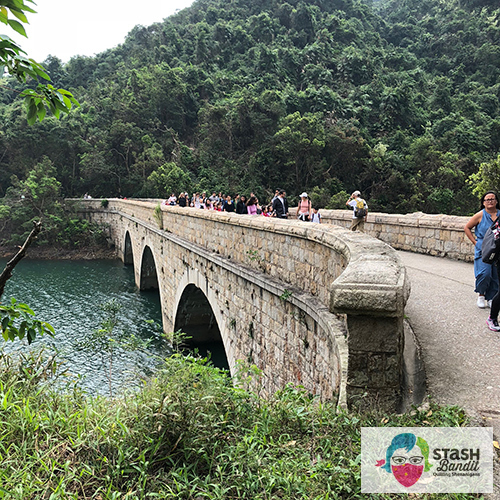 I stressed and fretted. Eventually I decided I could lose my mind worrying about it, or I could just plunge ahead. And plunge ahead I did. Funny thing was, even though the little intersections did not match up, by the time I got to the end of each row, things pretty much evened out. Every row was about the same length. And I realized that when you stood back from the quilt, you didn’t even notice the intersections. 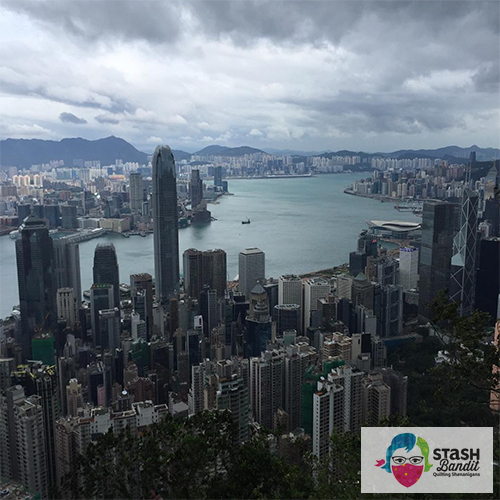 Instead you saw hundreds of tiny pieces, and it was actually starting to look like something spectacular. I forged ahead. It took some time to sew them back together, and I had just a small handful left over at the end. I decided it needed a border strong enough to be like an exclamation point without competing for attention. I chose a blue Moda Marble Dot. 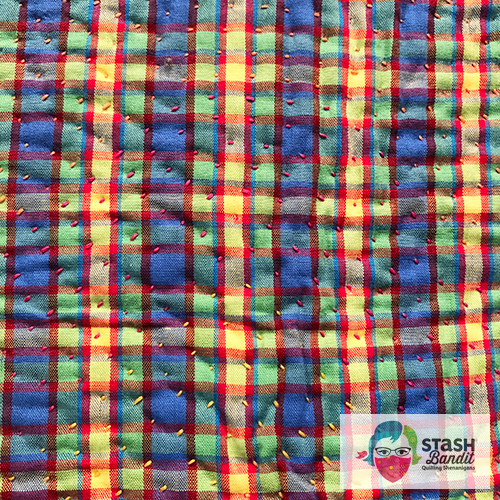 I sewed 10″ strips of it to the quilt top, bottom and sides. 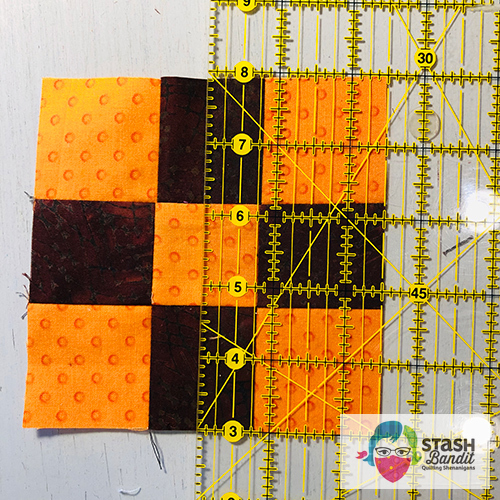 I used a walking foot to quilt the center with diagonal lines of straight and zigzag stitches. And then I had another idea which was actually born out of desperation because I knew my machine quilting could not do anything good for the border. 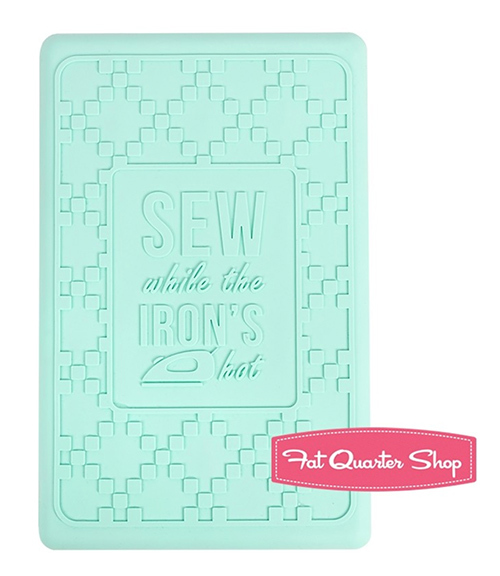 I love handwork but I can’t make tiny, beautiful quilting stitches. I’ve taken classes and practiced a lot but I just cannot do it. My solution was to do a big stitch by hand with three strands of embroidery floss. I knew I wanted to make wavy edges on this quilt, and I decided that wonky would be best since I didn’t know how to do the math to make them even. I drew a wonky curved line toward the outside of the wide borders, cut on the line, and bound the quilt with bias binding. 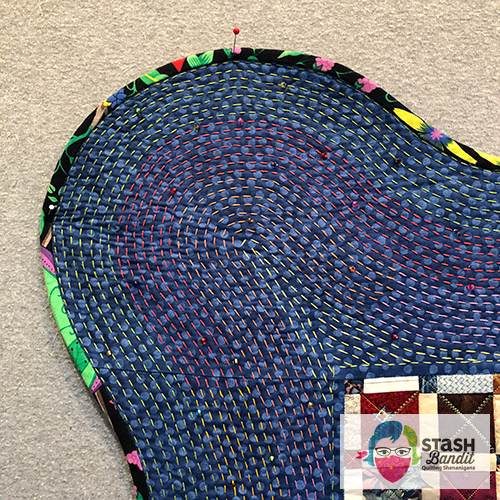 Then I made the first row of big stitches right next to the binding, and worked my way inward. Each row is about 1/4″ from the next. I changed colors randomly and just figured it out as I went. 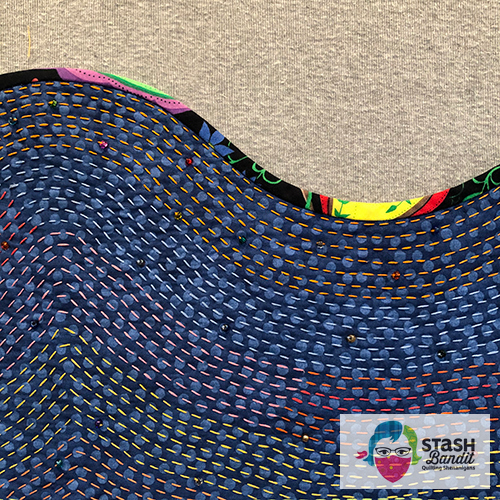 Well before I reached the center, I made one line of big stitches a fat quarter-inch away from the seam, outside the seam allowance. This gave me a good stopping point for the other stitching. 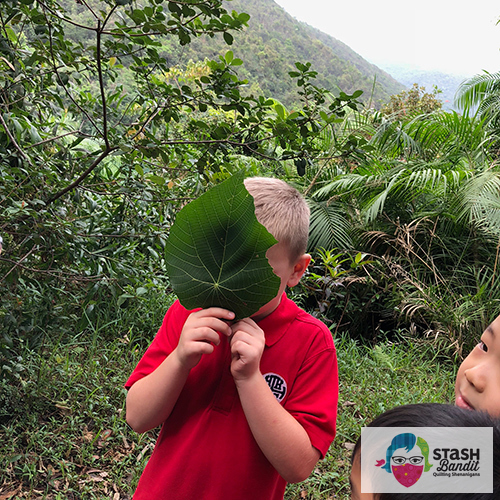 You can see it just above the Stash Bandit watermark on the photo above. I added in a few beads as an experiment. They are fine and they add interest but I don’t think they make that much difference in the big picture. Totally optional. 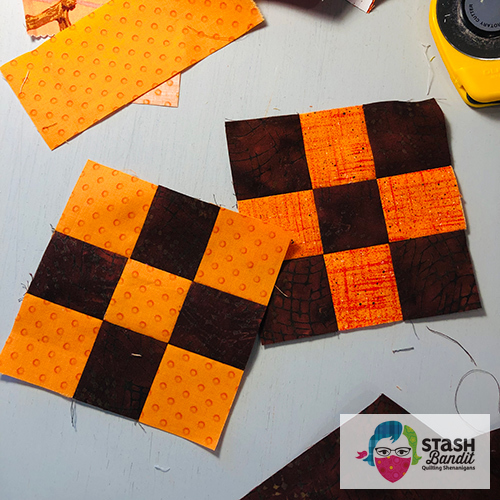 If you want to make a Nine Patch Jambalaya, start with 2″ strips or squares. 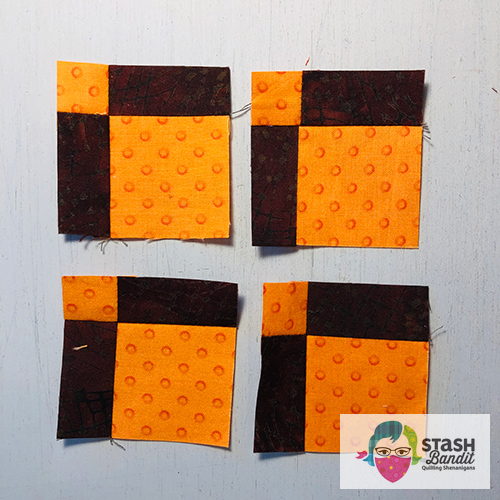 Make Nine Patch blocks until you’re tired of them. 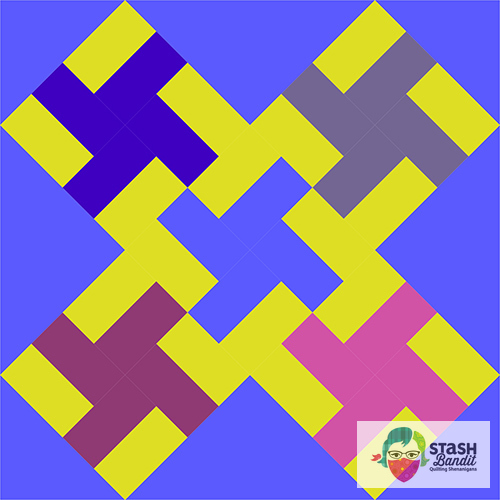 It doesn’t matter if the darker fabrics are in the middle and the corners as shown in the right block just above, or at the north/south/east/west positions as shown in the block on the left. In fact, you’ll want some of each kind. They will be 5″ unfinished. 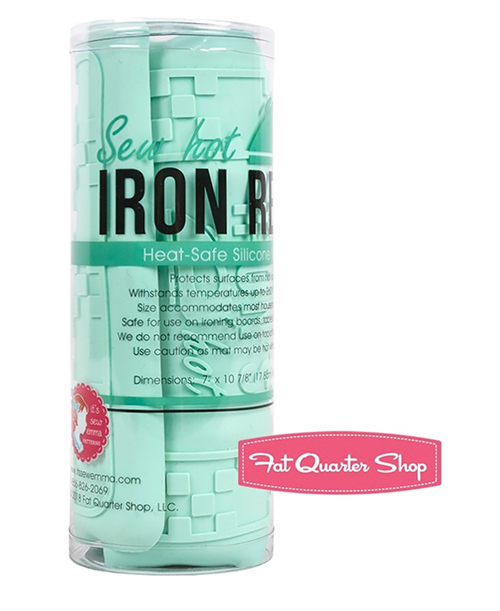 Cut them in half in both directions (vertically and horizontally). The middle will be 2-1/2″ from the raw edge. You’ll get four identical Jambalaya units. 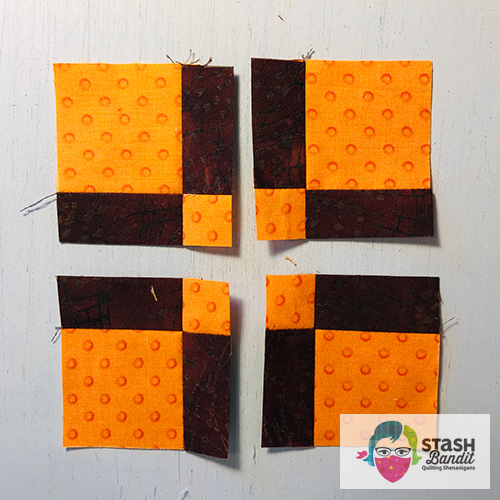 Mix them all up and sew them back together randomly, always keeping the tiny square in the same position. It doesn’t matter which corner you have it in, as long as you’re consistent. 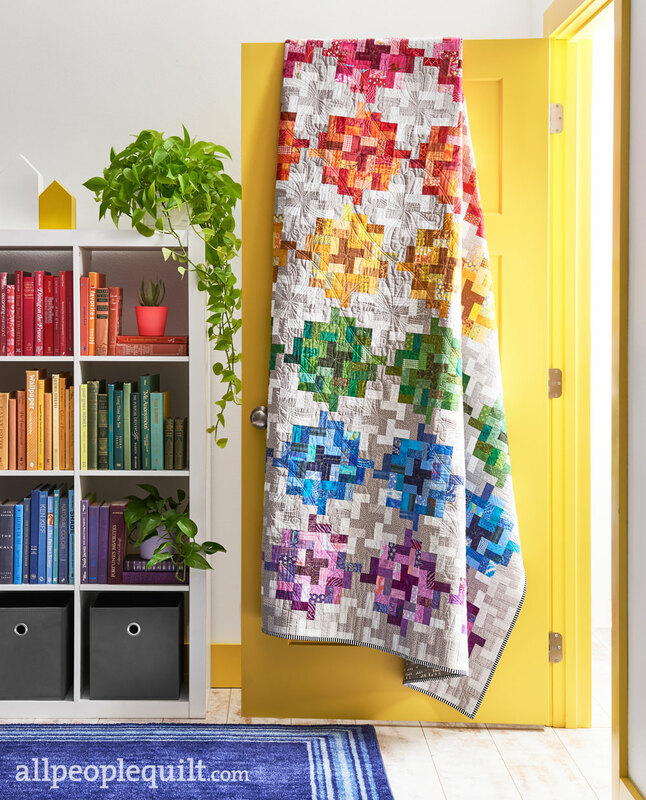 Make the quilt center as large as you want it. Mine is about 28 units across and 31 units down for a total of 868. (That requires 217 Nine Patches to start.) But it really doesn’t matter. Attach wide borders (about 10″) to the sides, the top and the bottom. Cut the wavy edges wonky. Bind with bias binding. 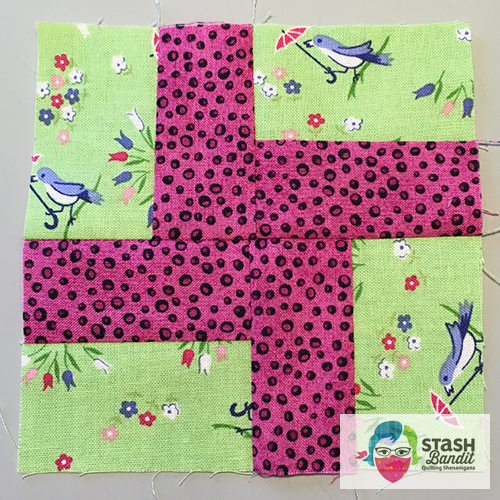 Use three strands of regular embroidery floss in your choice of colors for the big stitches in the border, making the rows about 1/4″ apart. 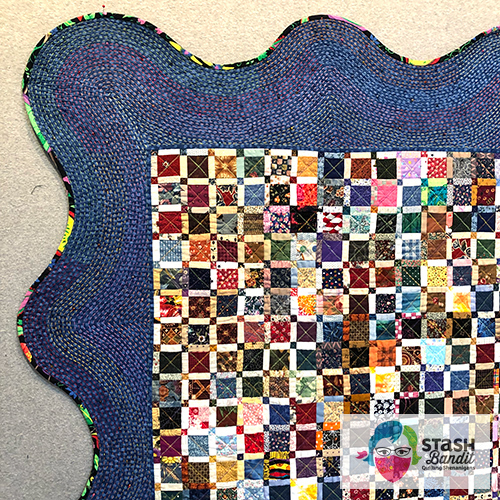 It’s worth noting that in order to make the big stitches look nice on the front of the quilt, they are very short on the back of the quilt. They look totally different. This is how the big stitches look on the back side of the quilt. 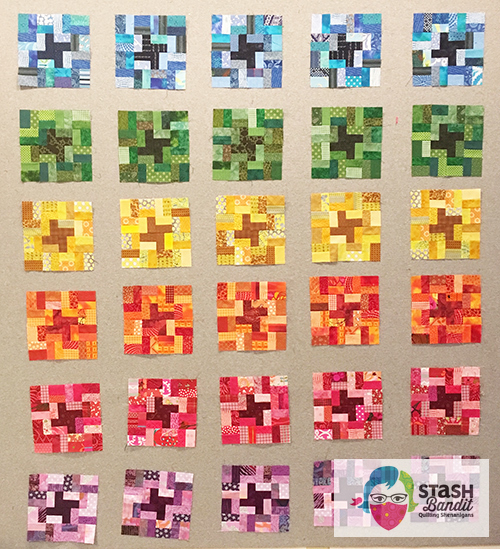 If you make a Nine Patch Jambalaya, please email me a photo using diane@stashbandit.net. I’d love to hear from you. And tell you what: If you want to get started, I will make you a few Nine Patches and send them to you. Just ask! 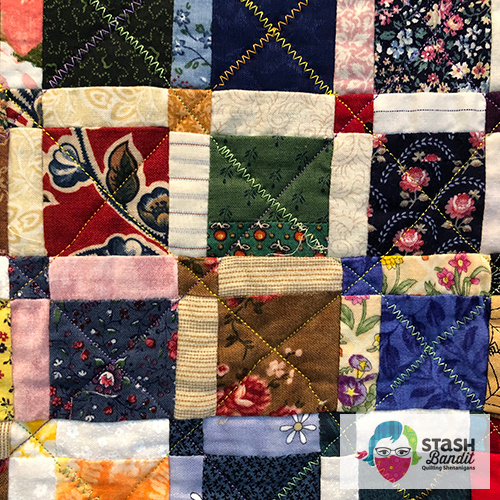 QuiltCon is the annual gathering of The Modern Quilt Guild, and it was held last week in Nashville. 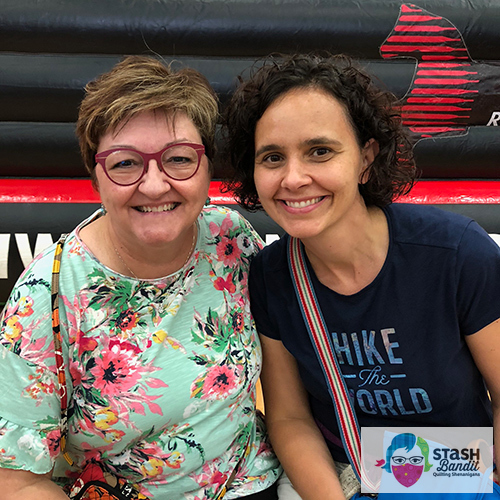 I decided to go because I’m interested in what’s happening in this arm of the quilting world. 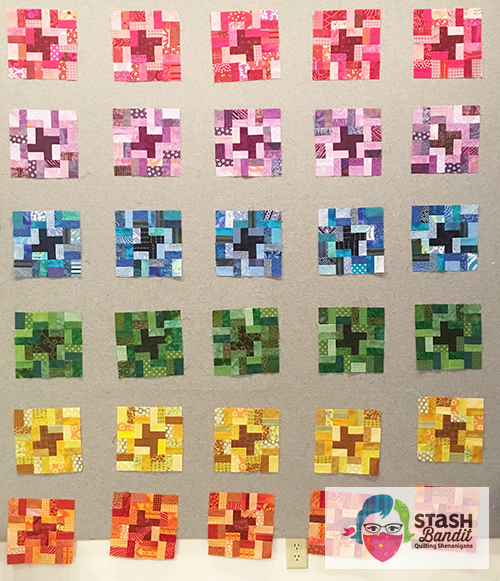 Today I’m sharing photos of some of the quilts in the juried show. Wild Goose Riot by Wendy Hill from Sunriver, Oregon; @wendyquilter. This quilt didn’t photograph especially well but I stood in front of it for a long time, which Jo Morton says is the mark of a successful piece. It’s a happy quilt and there’s a lot to see. I’ve been working on a new quilt design to add to the Windy Wonders trunk show. That program is booked for Omaha Quilters’ Guild next week and I want to give them lots of eye candy. I thought a few more quilts would be nice, and since my sketchbook is overflowing, it wasn’t hard to do. I grew up near a little town called Battle Creek here in Nebraska. Our colors were purple and gold so I spent many days in those colors. 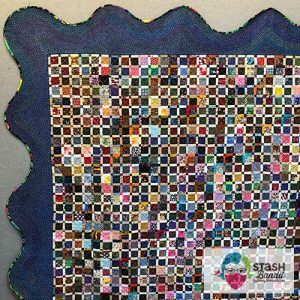 Lisa Walz is a quilting friend from Highlands Ranch, Colorado. We’ve been going to the same quilt retreat for many years. 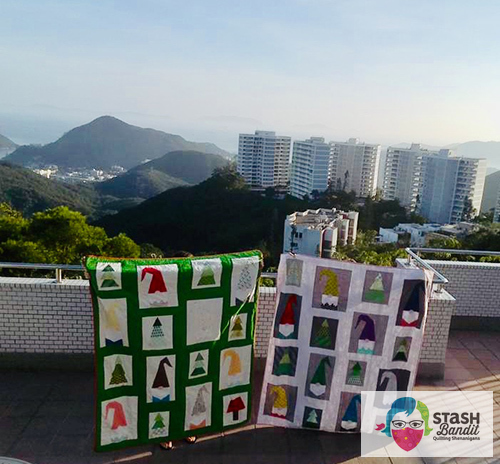 At one of those retreats, she mentioned a unique way of documenting her quilts and I asked if she’d tell you about it. Here’s Lisa, in her own words. 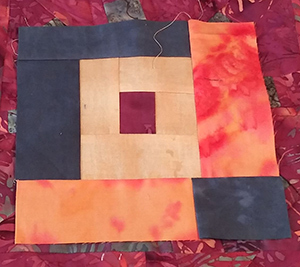 I’m making a quilt of my own design that will become part of two guild programs,* but it’s not going well. I’m undecided about what to do. I know what I should do but I’m unwilling to do it. I saw the most interesting photo on Instagram last week. 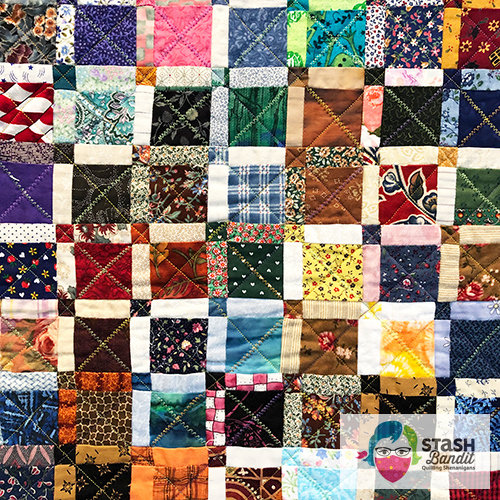 The South Sound Modern Quilt Guild in Olympia, Washington posted this image from their show and tell, and I had to find out more. I mean who wouldn’t be curious about the story of this quilt? 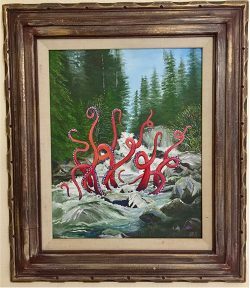 Giant octopus arms on a traditional Nine Patch? There has got to be a story there.